Book Review Deadline By Will Steacy Reviewed by Blake Andrews The boom-bust cycle is a familiar phenomenon of capitalism. Whether it's gold, timber, housing, or Cabbage Patch Kids, it's always the same bubble. An industry becomes successful, gradually attracts investment and speculators, then quickly crashes as the economy shifts to other sectors, usually leaving a trail of societal destruction as jobs, families, and communities are left in the lurch. b. frank books, Zurich, 2015. In English. 80 pp., 677 four-color color and black & white Illustrations. Newspaper formatting. Loose Leaf., 11x22". The boom-bust cycle is a familiar phenomenon of capitalism. Whether it's gold, timber, housing, or Cabbage Patch Kids, it's always the same bubble. An industry becomes successful, gradually attracts investment and speculators, then quickly crashes as the economy shifts to other sectors, usually leaving a trail of societal destruction as jobs, families, and communities are left in the lurch. That's when the photographers begin circling above. Until recently not many would've guessed that the newspaper business was a boom-bust industry. Newspapers? Newspapers didn't crash, they reported the crash. They observed from the sidelines, firmly planted on civic bedrock. 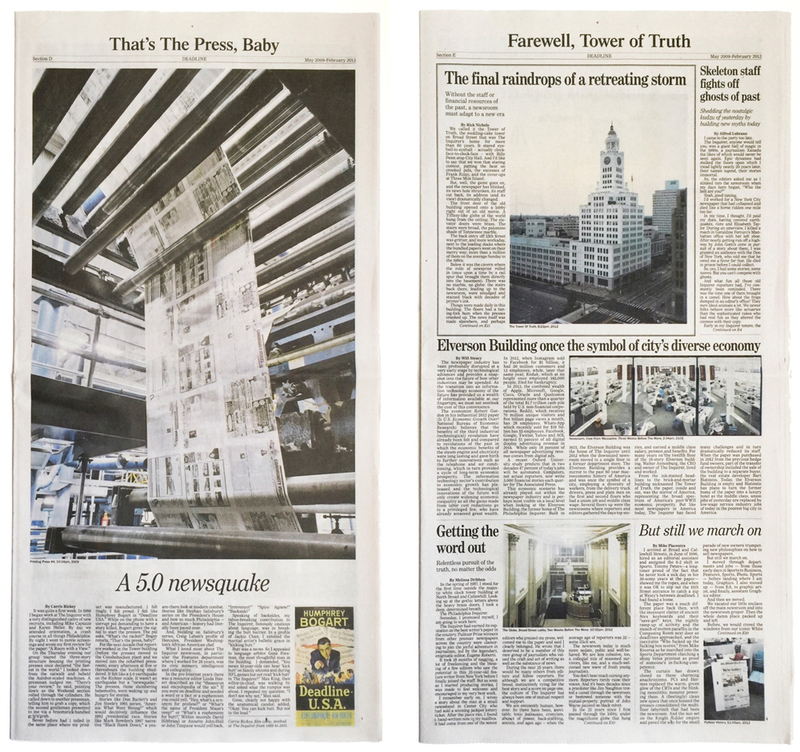 Looking back on the newspaper industry now — or what's left of it — that outlook seems naive. The cause and effect is clear in hindsight — the Internet tsunami has hopelessly scrambled the physical trades, especially media. But during journalism's heyday just a few short decades ago, who woulda thunk it? 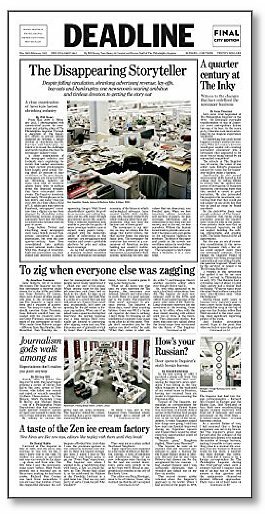 Newspapers busted? Yup, it's true. Print journalism has cratered and it's probably never coming back. Whether this is just another economic wrinkle or a cultural shift with wider ramifications will probably depend on your point of view. If you're a macroeconomist or curious observer, it's the former. If, however, you come from five generations of journalists, the shift is likely to assume a seismic quality. Enter Will Steacy, photographer by trade, journalist by heritage. His father was a newsman (an editor for The Philadelphia Inquirer), along with his grandfather, as was his great-grandfather and so on, back to great great-great-grandfather Hyram Young, proud founder of a daily paper in 1876. Steacy escaped the cycle, sort of, pursuing a profession outside of newspapers, but it remained in his blood. Deadline. By Will Steacy. b. frank books, 2015. When The Philadelphia Inquirer began to founder in the early years of the millennium, Steacy smelled a photo essay. Over the course of roughly four years, May of 2009 to February of 2013, he photographed the newsroom and printing facilities of the once proud Inquirer with unrestricted access. The resulting publication Deadline is a project of mammoth scope and ambition. Although it contains Steacy's photo essay, and will be sold in photobook stores and marketed to the photobook community, this isn't a traditional photobook. Instead it's a full-sized newspaper, as thick as any Sunday edition. 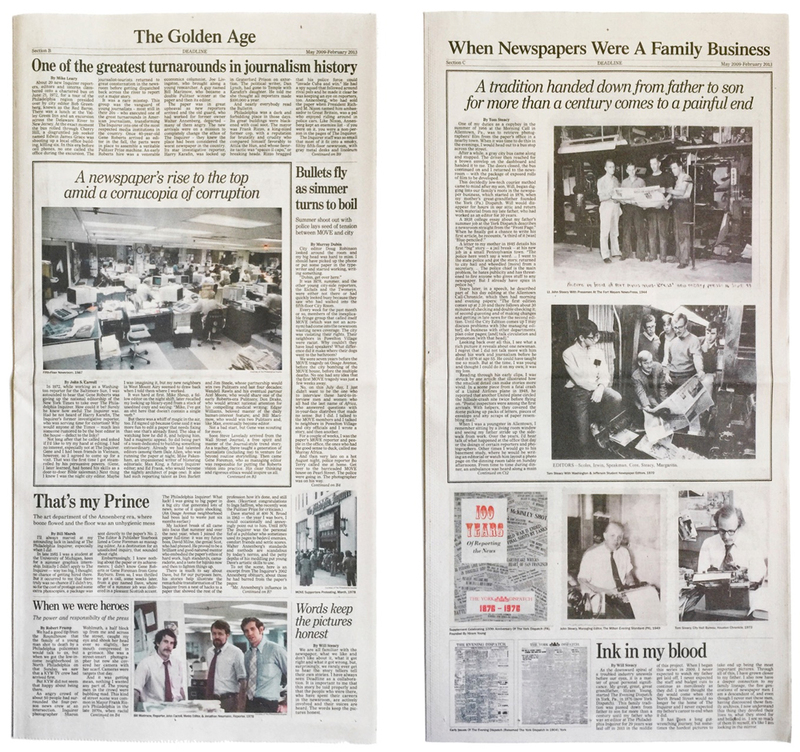 Will Steacy tops the masthead, but like any paper Deadline is a collaborative effort, incorporating 70 original essays spread across five sections, and wide contributions from the Inquirer staff, including Will's father Tom. But there's more. Deadline was printed using The Inquirer press facility. Every part of the production is modeled on The Inquirer, from layout to typeface to banner ads to paper type. The very structure of the old Inquirer building, with clock tower crowning a Deco mini-skyscraper of blank offices, seems to portend a bygone era, and it's nicely captured in a Steacy portrait heading section E. I'm old fashioned enough to still read a print newspaper every morning, and Deadline is a perfect facsimile. The paper spreads between the hands over a kitchen table, sections tumbling loosely, rubbing ink smudges on the fingers. The pages crinkle audibly just like normal newsprint. The mimicry is so faithful that it borders on parody. But Deadline is nothing to laugh about. The Inquirer's demise is a sorry tale. If you need a primer, Deadline recounts the story section by section: The Golden Age, Deadline, That's The Press Baby, and Farewell, Tower Of Truth. Altogether it's the history of The Inquirer's rise and fall, extended in journalistic fashion to the entire industry. Tucked in the center is Section C: When Newspapers Were A Family Business. Through old photos, news clips, journal entries, and articles, Steacy scrapbooks together his family's long run in journalism. He titles a short essay "Ink In My Blood." The section's lead caption? "A tradition handed down from father to son for more than a century comes to a painful end." We get the picture: it's personal. Family history might've come across as sappy nostalgia in lesser hands. But Steacy's keen edit has crafted a moving portrayal, told mostly in images, all the way to the point his father was laid off. This is the only section of Deadline that does not feature Steacy's photojournalism, and so it has a slightly different flavor than the others. It's not the exposé you'd find in a typical paper. Nevertheless it serves as Deadline's emotional core. Steacy's passion comes through in the other sections as well, sometimes assuming a messianic tone. He's named Deadline's publisher b.frank books, the guise of an imprint speaking truth to power? "The voice of the people will never be silenced," he exclaims in one piece, words more suitable for a protest placard than a newspaper. Steacy intends Deadline as civic lesson and moral fable. If he has crossed the line from reporter to advocacy, that can be excused in the interest of artistic license, because, after all, Deadline is not an actual newspaper. But a reader at emotional remove might wonder at all the fuss. Industries shift. Screens replace print. Society moves on. In this context, is the fierce defense of newspapers simply knee-jerk nostalgia? For me it's not clear. In any case, one facet of the old era has been abdicated in the digital age: proofreading staff. Deadline is marred by several careless typos on the first page alone. I wrote earlier that Deadline is not a traditional photobook, and that's true. But it is a print vehicle for Steacy's photographs, so let me spend a moment on the photos. Steacy spent four years shooting this project and that dedication is clearly reflected in the imagery. They cover all gamuts of The Inquirer's production, shot in many styles from portrait to office scenes to sequential series. The photos display the quiet, well lit, and clean framing typical of large format photography, and it's a shame the reproductions can't match the content. Printed large on a gallery wall I'm guessing these images would provide plenty to dawdle over. But like any newspaper photograph, when they are shrunken to a 5" halftone on newsprint the quality shifts, not just the reproduction quality, but the photographic essence. The photos lose some oomph as fine art. This may be a conscious strategy by Steacy, to subsume his photographs to the wider story. Any photojournalist can relate. Still, it seems a shame to toss so much detailed content aside like yesterday's recycled newspaper. Truly happy to own this. Thanks Will Steacy, great review Blake.